The Anterior Interosseous Syndrome is a painful condition of the forearm. 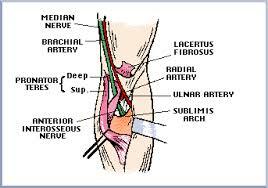 The anterior interosseous nerve is a branch of the median nerve, located just distal to the elbow. This nerve will be compressed by tendons and nerves in the forearm, particularly the pronator teres muscle or by abnormal blood vessels in the area. The patient with Anterior Interosseous Syndrome will have pain and weakness of the forearm and hand. The affected extremity will have weakness of grip and difficulty making the “OK” sign with the thumb and forefinger. The cause of anterior interosseous syndrome is usually trauma or repetitive motion injury, but may also be associated with Parsonage Turner syndrome. X-rays and MRIs of the arm are useful to exclude fractures and tumors. Electromyography(EMG) and nerve conduction studies (NCV) are used to exclude other causes such as a herniated disc in the neck. Treatment begins with conservative modalities such as heat, ice, physical therapy, non-steroidal anti-inflammatory medications. Injection of a local anesthetic and a steroid into the area may decrease inflammation and pain. If conservative treatment is ineffective, surgery to release the compression of the nerve may be needed.